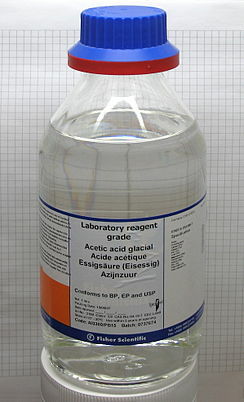 Acetic acid /əˈsiːtᵻk/ (seestematically named ethanoic acid /ˌɛθəˈnoʊᵻk/) is an organic compoond wi the chemical formula CH3COOH (an aa written as CH3CO2H or C2H4O2). ↑ Scientific literature reviews on generally recognized as safe (GRAS) food ingredients. National Technical Information Service. 1974. p. 1.